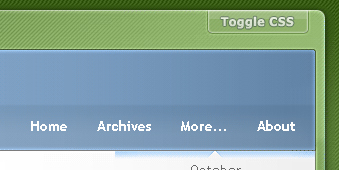 We recently had some requests to offer a wider version of our theme. Our server statistics showed that over 80% of our readers had screen resolutions greater than 1000 pixels wide. Therefore we decided to integrate a second CSS to our site’s theme and a bit of java to allow switching back and forth instantly. With a click of the “Toggle CSS” button, Skatter Tech‘s theme should instantly expand from its original 800 pixel wide format into one 1000 pixels wide. We will also leave a tiny cookie in your browser which will save your preference for future visits. P.S. We have tested this in MSIE 6.0 and Firefox 1.5+, let us know if you were able to get this to work in your browser or if you experienced any problems. Please reply in the comments. Links: Skatter Tech | Related: We’re Back!